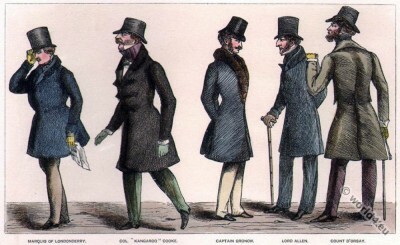 Regency dandies. England 1812. Habitués of White's. Home » Regency dandies. England 1812. Habitués of White’s. Regency dandies. England 1812. Habitués of White’s. From left: Marquis of Londonderry, Colonel “Kangaroo” Cooke, Captain Gronow, Lord Allen, Count D’Orsay. Artist Joseph Grego. From the book: The Reminiscences and Recollections of Captain Gronow, being anecdotes of the camp, court, clubs and society, 1810-1860. By Captain Rees Howell Gronow (1794–1865). Published: London, John C. Nimmo, 1889. Artist Joseph Grego (1843-1908). Free Ebook: The Reminiscences and Recollections of Captain Gronow. Volume 1 & 2. Tags: Regency period. Georgian Fashion. France Empire. Dandy Clubs – Dandysme, Satirical 19th century. The Second Republic. 1848 to 1851. Victorian era. “Second Rococo”. Reigns of Louis XVIII. and Charles X. 1815 to 1830. The Restoration period. Romanticism. Biedermeier era. Reign of Napoleon I. 1804 to 1814. First Empire, Regency period. This entry was posted in 1812, 19th Century, England, Georgian period, Regency period and tagged Dandy, Regency period, The Reminiscences and Recollections of Captain Gronow on 2/27/15 by world4.